We’d love your help. Let us know what’s wrong with this preview of Who's That in the Cat Pajamas? by Sojourner McConnell. To ask other readers questions about Who's That in the Cat Pajamas?, please sign up. "Equality", or equal rights & equal respect, are the essence of God's Universal message, put into all good hearts & known as The Golden Rule, we most need to grow in if we are to have a better world. Inequality we have grown up in, & most men are indoctrinated by birth into a sense of superiority compared to the female half, but eventually, most females refuse to believe it, & it has negative effects? Emily is faced with moving to a new place and is upset to leave her friends and her Nana. In comes, or should I say flies, Dolcey to help. This is a good little book for any child experiencing a change, especially moving to a new place or for any child experiencing a tough time. Dolcey even throws in a history lesson. A wonderful book for children afraid of moving to a new home! Who's that in the Cat Pajamas by Sojourner McConnell, is a wonderful new chapter book for children who love fairies and are afraid of moving to a new home. In this delightful tale, a fairy called Dolcey wears a cat costume and comes to the aid of children in distress. When Dolcey hears Emily's cries, she magically appears in her cat disguise to sooth her. Emily is immediately enchanted with the cat which her parents believe is a stray A wonderful book for children afraid of moving to a new home! Who’s That in the Cat Pajamas? (The Dolcey Series Book 1) By Sojourner McConnell, Illustrated by Ellie Barrett, 40 pages, June 2nd 2017, ISBN: 978-1545150269, Genre: Multigenerational, Children’s Books, Family Life. Format: Kindle. Warning: May Contain Spoilers. The age range for this book is listed as 5-12 years of age. I confess that I’m way older than 12, but I adored this cute children’s tale. Nobody likes dealing with change, particularly when you’re a child wit Who’s That in the Cat Pajamas? (The Dolcey Series Book 1) By Sojourner McConnell, Illustrated by Ellie Barrett, 40 pages, June 2nd 2017, ISBN: 978-1545150269, Genre: Multigenerational, Children’s Books, Family Life. Format: Kindle. Warning: May Contain Spoilers. The age range for this book is listed as 5-12 years of age. I confess that I’m way older than 12, but I adored this cute children’s tale. Nobody likes dealing with change, particularly when you’re a child with no control over where you live. Change is difficult for everyone, but sometimes all that’s needed to embrace it is viewing it with a new set of eyes and a new attitude. The fairy Dolcey has a special ability she learned from her mother. With this skill, she can find and help children who are sad or have a big problem. Dolcey finds Emily Patton, a little girl who is scared of moving to a new place. Dolcey befriends Emily in the form of a cat by wearing cat pajamas. By day, Dolcey is a lovable, cold, hungry stray whom the family decides to take in. By night, she is a fairy, helping Emily come to terms with the changes approaching in her life. The book slowly provides children with the lesson that while change is hard and even scary, change can also be a wondrous adventure; an opportunity of a lifetime. Parents love their kids and make decisions they feel are best for them and the entire family as a whole. Trusting your parents can make change less difficult. Just as the kitty cat came into a new environment not knowing what to expect and found a loving home with new people, so too will Emily be able to make a new and happy life in her new town. Life kicks a lot of change our way, and it starts when we are young. In this case, the upset of a move is eased by a young fairy new to her task of easing children's fears. Dolcey, the fairy, slips into a cat costume and acts the part of a stray so as to insinuate herself into the family. Little by little, she helps Emily to sort through her sadness at the prospect of saying goodbye to the familiar and to actually begin anticipating the move. This is a gentle book likely to appeal to sensitive c Life kicks a lot of change our way, and it starts when we are young. In this case, the upset of a move is eased by a young fairy new to her task of easing children's fears. Dolcey, the fairy, slips into a cat costume and acts the part of a stray so as to insinuate herself into the family. Little by little, she helps Emily to sort through her sadness at the prospect of saying goodbye to the familiar and to actually begin anticipating the move. Do you like change? Few of us if any do. Change is hard. It disrupts our routine. It moves us from the comfortable and familiar to the uncomfortable and unknown. Change is difficult for adults. It is worse for kids who have not had the experience to know how to handle change. Kids don’t often have a say in the change thrust upon them by adults. They don’t understand and can’t see the potential good in a change. How do we teach kids to handle change? How do we get them to understand that we have Do you like change? Few of us if any do. Change is hard. It disrupts our routine. It moves us from the comfortable and familiar to the uncomfortable and unknown. Change is difficult for adults. It is worse for kids who have not had the experience to know how to handle change. Kids don’t often have a say in the change thrust upon them by adults. They don’t understand and can’t see the potential good in a change. How do we teach kids to handle change? How do we get them to understand that we have their best interest in mind? How do we help them see the good in tragedy, in difficulty, and in change? Experience will certainly be a teacher as we guide them through the inevitable. We can also prepare them in advance. One way is to give them an example. A good example for them to see is in the storybook Who’s That in the Cat Pajamas? by Sojourner McConnell illustrated by Ellie Barrett. It is the first book in The Dolcey Series. Dolcey is a fairy whose mission is the help young Emily navigate the difficulty of change. Emily is moving. She’s moving away from her Nana and Aunt whom she loves dearly. She’s clearly upset. She displays all the emotions that a young child would have who is facing a difficult change. She has no say in the change. She can’t see the good in being far away from her loved ones. Dolcey’s job is to show her the good in the adventure she’s about to undertake. Dolcey disguises herself as a cat and is let into the family as a stray. She reveals her true identity to Emily and shows Emily the wonders awaiting her in her new home. All children will face change. It may not be a move, but they will experience loss, disruptions, and unknowns. Reading a book like Who’s That in the Cat Pajamas? offers the opportunity to discuss change and how to look for the good in the change. Talking about change and asking good questions can help a child think and prepare for the inevitable. I would recommend this book as a good tool to use to help a child through changes. There was a popular book titled Who Moved My Cheese? By Spence Johnson. It was a book to help adults through change. It was required reading for one job I had. If adults can be helped by a book on change, how much more can children be helped by a book on change? 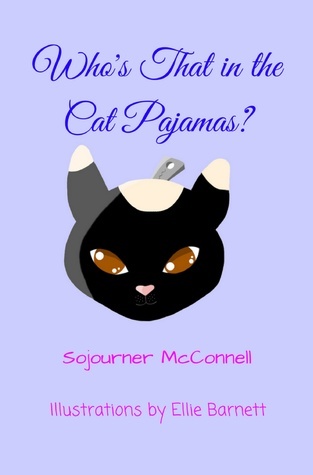 The recent book release of Who's That in the Cat Pajamas (The Dolcey Series Book 1) by Soujourner McConnell is the delightful story of a young girl's struggle with the real world problem of leaving everything behind. She must move to a new town with her parents, and she is none too happy about it. A pajama-clad kitty with a secret surprise helps pave the way for our young heroine. Together, they explore what life might be like in new surroundings. Children of all ages will be immersed into thoug The recent book release of Who's That in the Cat Pajamas (The Dolcey Series Book 1) by Soujourner McConnell is the delightful story of a young girl's struggle with the real world problem of leaving everything behind. She must move to a new town with her parents, and she is none too happy about it. A pajama-clad kitty with a secret surprise helps pave the way for our young heroine. Together, they explore what life might be like in new surroundings. Children of all ages will be immersed into thought-provoking prose that carries the imagination to souring, new heights. The love with which Soujourner McConnell wrote this book is evident from page one. Dolcey is magical and possesses special senses deftly tuned toward children in need of a little extra guidance. She finds such a child when she seeks out Emily. Dolcey's tender caring leads Emily in a direction she is unsure she wants to see. But what awaits them is both revealing and tender and will leave you wanting more adventures from Dolcey. Who's That in the Cat Pajamas is a 5-star read and should reside among other classics on your children's bookshelf. To get your copy today, visit Amazon for a free Kindle Unlimited version or just $1.99 for your very own e-copy. To learn more about the author, visit Soujourner McConnell's Amazon biography, or at Who's that Indie Author on www.SherriesAlwaysWrite.com. Be sure to check out other books by Sojourner McConnell. Stop by to like her Facebook page or follow Dolcey on Goodreads. When the wind brings the cries of children to her ears, Dolcey is spurred into action. Comforting and aiding children in need are her main focus. Welcome to Dolcey's world. Welcome to a world of magic and endless possibilities. When Emily has a big problem, her family tries to help, but some problems need something special to make things right. In Emily's case, the special treatment is a visitor named Dolcey. What an exciting time of life it is to be a reviewer! I was super proud to be able to re When the wind brings the cries of children to her ears, Dolcey is spurred into action. Comforting and aiding children in need are her main focus. Welcome to Dolcey's world. Welcome to a world of magic and endless possibilities. When Emily has a big problem, her family tries to help, but some problems need something special to make things right. In Emily's case, the special treatment is a visitor named Dolcey. What an exciting time of life it is to be a reviewer! I was super proud to be able to read this fabulous children's tale and it's one that I am going to be giving to all my nieces; nephews; cousins and friends kids! It has a beautiful message, beautiful imagery and is so beautifully innocent that I couldn't help but wish it was around when I was younger. McConnell has outdone herself this time and I highly recommend this book to anyone - young or old - if you're looking for something fun to read. When a little girl is feeling sad and upset due to changing circumstances that are beyond her control, who better to come to her aid than a fairy. Dolcey’s mother is a helper of children in need and she has trained Dolcey well, right down to the cute cat pajamas that Dolcey wears to gain access to Emily’s home and become a part of her family without raising eyebrows. Emily’s family are planning to move to a town far away and Emily is fearful of losing her Nana, Aunt Fee and school friends. Can D When a little girl is feeling sad and upset due to changing circumstances that are beyond her control, who better to come to her aid than a fairy. Dolcey’s mother is a helper of children in need and she has trained Dolcey well, right down to the cute cat pajamas that Dolcey wears to gain access to Emily’s home and become a part of her family without raising eyebrows. Emily’s family are planning to move to a town far away and Emily is fearful of losing her Nana, Aunt Fee and school friends. Can Dolcey help Emily to overcome her fears and see the benefits to a new environment? I read Who’s that in the Cat Pajamas with my son, Michael, aged 11 years old. I wasn’t sure if Michael would listen to a book that had a fairy as its central character, but he did. Dolcey’s portrayal in the book brings her across more as a kind and helpful friend than a girly fairy and so Michael was happy to listen to the story. Michael is a very considerate and helpful boy and the idea of someone reaching out to help another person really appealed to him and he enjoyed the story. The illustrations are lovely and appropriate and I would recommend this book for children aged 6 to 12 years old. This was such a special book for me to read with my 6 year old. We are facing a move ourselves and while she's managed to understand the need, I know she's also been experiencing a little anxiety about it. Dolcey helps children come to terms with problems they may be experiencing in their lives. She is sweet and friendly, and what I 'got' from her character is she seemed to rely on letting Emily know it was ok to talk about how she was feeling and that she would listen to what Emily had to say. I This was such a special book for me to read with my 6 year old. We are facing a move ourselves and while she's managed to understand the need, I know she's also been experiencing a little anxiety about it. I know the author personally, but that has nothing to do with my rating. I know this was meant as a Children's book, but honestly, couldn't we all use a little Dolcey? I know that little elf inspired me with hope and I'm looking forward to her stories of helping others. The illustrations are beautiful and Dolcey may have passed her uncomfortable cat pajamas on, but I can't wait for her next incarnation. I love Dolcey, and the way she interacts with Emily is so sweet and caring. Moreover, I read this book to a six-year-old that our daughter babysits – and she loved it! A book that holds the attention of a kindergartner is five-star all the way. Fantastic ending. This chapter book charmed the socks off of me! Dolcey is so sweet, and loving! The story is relevant and moving. The illustrations are perfect for the story. I can't wait for another Dolcey book! I liked this book, what a wonderful way to introduce a new idea to a child. It was written with care and concern to benefit the entire family. Lovely story for children dealing with change. I liked how the author incorporated modern technology and the history of the pioneers into the story about a little girl moving away from her family. The littlest one absolutely loved this, and the older kids and I loved the message involved. There were a couple of pictures that were really cute, but I have to admit that their favorite part was the recipe and crafts at the end! A super way to end this book. This children's book is beautiful and fanciful. It allows a child to exercise their imagination (something that is sorely needed in today's world), through the use of a magical fairy as the pivotal protagonist. Dolcey undergoes a metamorphous that both comforts and teaches the child how to solve the issues that she faces as her family transitions to a new house and new community. Well done, Sojourner! I look forward to reading the subsequent books in The Dolcey Series. I enjoyed this book from start to finish. The author has written it very eloquently, but still simple enough for a young child to read and understand. I enjoyed the imaginative storyline. Being from a military town where families move frequently, it also addresses a topic that many children can relate to. I hope she will continue to write more children’s books. A delightful story with some wonderful illustrations. Ms McConnell has written a story about a fairy whose mission in life is to help and comfort children in need. Emily's parents have told her they are moving to a new town and it is up to Dolcey to show her that even though life can be difficult, there can be a happy outcome if you change the way you think. An imaginative tale to be enjoyed by all children (and parents!) but especially those who need a reminder that life is all about how you loo A delightful story with some wonderful illustrations. Ms McConnell has written a story about a fairy whose mission in life is to help and comfort children in need. Emily's parents have told her they are moving to a new town and it is up to Dolcey to show her that even though life can be difficult, there can be a happy outcome if you change the way you think. An imaginative tale to be enjoyed by all children (and parents!) but especially those who need a reminder that life is all about how you look at it. This is a wonderful story of a young girl named Emily. Emily is very sad to learn they will be moving.She wants to stay where she is near her aunt and grandma and all of her friends. Dolcey is a young fairy who has a special job. She needs to make Emily understand that everything will be okay when she moves. She has a special set of cat pajamas she wears to make the family accept her. Then she reveals her true self to Emily. Will she be able to convince Emily that everything will be okay? A wond This is a wonderful story of a young girl named Emily. Emily is very sad to learn they will be moving.She wants to stay where she is near her aunt and grandma and all of her friends. Dolcey is a young fairy who has a special job. She needs to make Emily understand that everything will be okay when she moves. She has a special set of cat pajamas she wears to make the family accept her. Then she reveals her true self to Emily. Will she be able to convince Emily that everything will be okay? A wonderful series. I look forward to reading more about Dolcey's adventures. Born and raised in Birmingham, Alabama. Sojourner McConnell lives in Winchester, Kentucky with one of her daughters and three of her thirteen grandchildren. She has six grandchildren in Alabama and four that live in Michigan. With all those children and grandchildren, she has crafted her storytelling skills. Sojourner's new book is a children's chapter book, Pup in Training and is just now availab Born and raised in Birmingham, Alabama. Sojourner McConnell lives in Winchester, Kentucky with one of her daughters and three of her thirteen grandchildren. She has six grandchildren in Alabama and four that live in Michigan. With all those children and grandchildren, she has crafted her storytelling skills. Sojourner's new book is a children's chapter book, Pup in Training and is just now available on Amazon. Book 2 in the Dolcey Series, When a Pachyderm Comes to visit, The Path of the Child, The Power of Forgiveness, and 31 Days of October volume 1 and 2, are also available in paperback and in eBook format on Amazon and other retailers. Sojourner brings a taste of strong personalities with a healthy dose of southern charm to her characters. .